President Rodrigo Duterte of the Philippines chats with President Donald Trump during the gala dinner at the Association of Southeast Asian Nations summit in Pasay City, Philippines, on November 12, 2017. Photo credit: Presidential Communications Operations Office / Wikimedia. President Donald Trump’s affinity for the world’s strongmen seems to be a mix of admiration and fascination. But for the authoritarian leaders who love him back, the fondness is less about chemistry and more about Trump’s bellicose language that breaks the norms of liberalism. Trump’s rhetoric — like threatening to jail political opponents or urging police to be violent with criminal suspects — has been echoed across the globe and used to justify human-rights abuses, attacks on the press, and the suppression of free speech. And while Trump may walk back particularly pernicious comments or say they were jokes, the message is heard loud and clear by repressive governments. Earlier this month, the official Twitter account of the Nigerian Army posted a video of Trump saying US forces could open fire if migrants start throwing rocks at the southern border. The post came days after Nigeria’s military fatally shot rock-throwing demonstrators in Abuja. “Sickening,” former US ambassador to the United Nations Samantha Power called the tweet. The video was deleted hours later after sparking outrage online. Duterte and Trump also seem to share the same playbook when discrediting critics and conflating opponents with extremists. Trump warned about “left-wing violence” ahead of the November midterms and implied Democrats were supportive of “violently” overturning his policies. Yet, no topic has reverberated more around the world than Trump’s attacks on the press; the mantra of “fake news” has especially resonated with the world’s strongmen. Israeli Prime Minister Benjamin Netanyahu used the term to blast the press for its reporting on a Hamas agreement which, while not recognizing the state of Israel, accepted the formation of a Palestinian state along the 1967 borders. Syrian President Bashar al-Assad also used the term to discredit Amnesty International’s 2017 report on torture and mass hangings in military prisons. “You can forge anything these days,” al-Assad told Yahoo News. “Authoritarian regimes all over the world can now take full advantage of Trump’s war with the media by discrediting mainstream news coverage and calling it ‘fake news,’” Noni Ghani, a spokeswoman for Reporters Without Borders told WhoWhatWhy. “This rhetoric has even more serious consequences in countries that do not have First Amendment protections and where impunity prevails,” Ghani added. Duterte too has employed the term to describe critical press. “When President Trump called CNN and the New York Times ‘fake news,’ a week later, President Duterte called Rappler fake news,” Maria Ressa, executive editor of the Philippine news website Rappler, said while being honored by the Committee to Protect Journalists. 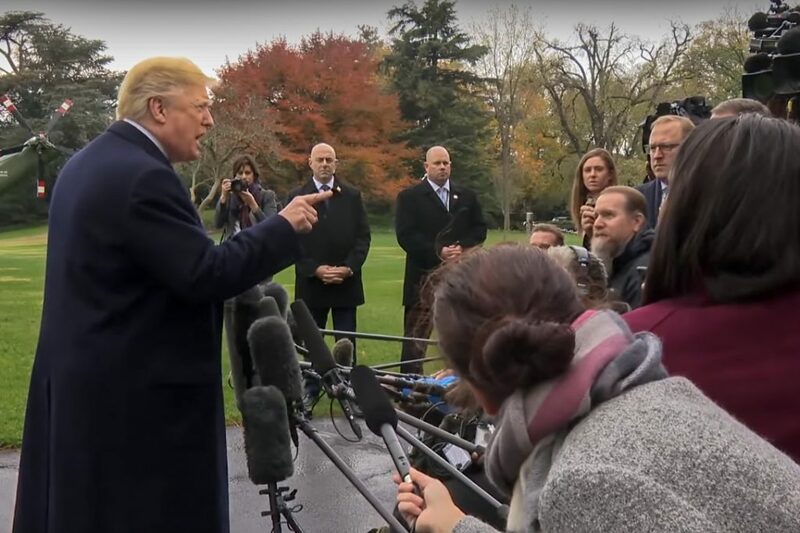 President Donald Trump takes questions from the press on the White House lawn on November 9, 2018. Photo credit: The White House / YouTube. The degrading of reporting is particularly worrisome to activists who fear the hostility will extend to the reporters themselves. Particularly concerning is the situation in Turkey, where President Recep Tayyip Erdogan has jailed a record number of journalists and seized or pressured nearly all independent news outlets since the attempted coup against his government in July 2016, according to Human Rights Watch. Erdogan — apparently moving past Trump’s remarks about Islam — has also praised Trump for his hostile attitude toward the press. In January 2017, he hailed the then president-elect for putting a CNN reporter “in his place” while also deriding Western press for its coverage of pro-democracy protests in 2013. Trump’s “attitude towards the press seems to convey the idea to the rest of the world that it is OK to attack journalists and undermine their right and duty to report,” Philippe Leruth, president of the International Federation of Journalists, told WhoWhatWhy. Authoritarian leaders elsewhere have felt empowered to scorn the press and seem to enjoy having a like-minded leader in the White House. 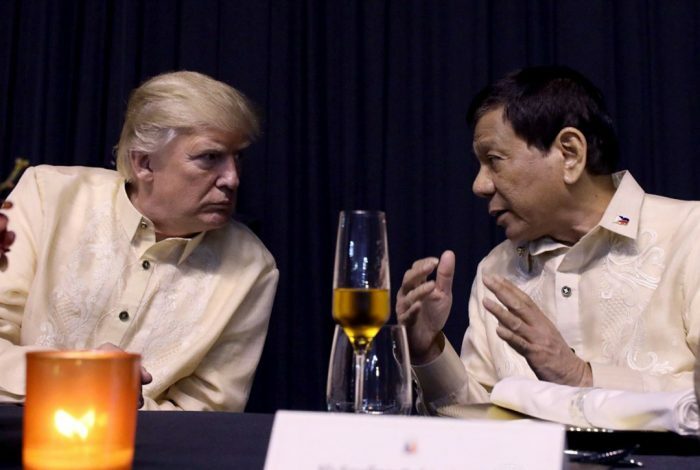 While visiting Manila, Trump and Duterte shared a laugh after the Philippine president called the media “spies” during a brief photo opportunity. In Egypt, ahead of the March 2018 elections, which were widely regarded as a farce, President Abdel Fattah el-Sisi blocked hundreds of websites that his government deemed “fake news.” The UN also warned that a “pervasive climate of intimidation” surrounded the vote and that journalists were being targeted by authorities. “We are very impressed by the enthusiasm and patriotism of Egyptian voters,” the US Embassy in Cairo tweeted on election day, which saw a worryingly low turnout. President Donald Trump greets the President of Egypt, Abdel Fattah el-Sisi, prior to their bilateral meeting in Riyadh, Saudi Arabia, on May 21, 2017. Photo credit: The White House / Wikimedia. 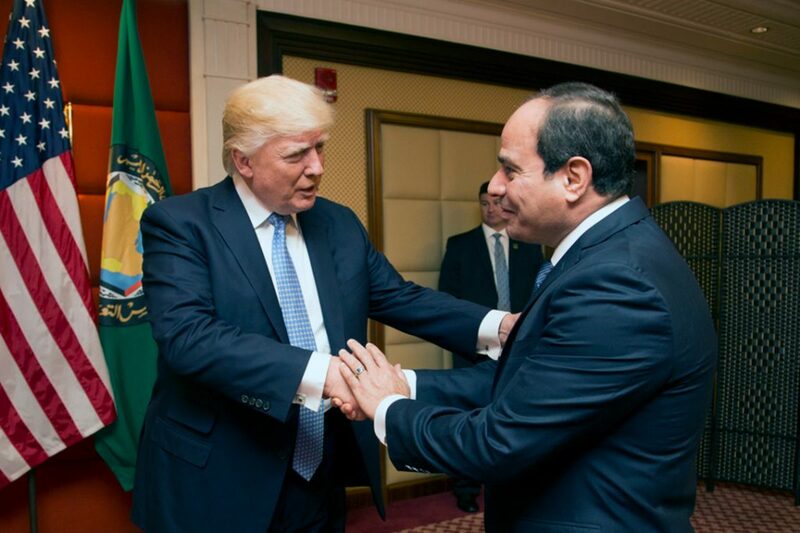 The election came less than a year after Trump welcomed el-Sisi to the White House, reversing a policy set by President Barack Obama, who refused to invite the Egyptian leader to Washington due to concerns about human-rights abuses. Since the midterm elections — which were preceded by attempted bombings at CNN — Trump has shown little sign of cooling his rhetoric against the media. “In a country that prides itself as one of the world’s leading democracies and a champion of the First Amendment, its own executive has set an ugly precedent for leaders around the world and they seem to be closely following his lead,” Ghani said. Yet while a robust media environment and a now more balanced Congress may reinforce the US press, the consequences of the recent trends could last for decades in other countries.